UCO have released a new Stormproof Survival Kit, which includes the essentials for fire, cooking, and shelter all in a compact lightweight bag. September is National Preparedness Month. It is a time to prepare yourself and those in your care for emergencies and disasters, both large and small, as emergencies can happen unexpectedly in any community. Having a plan of action will give you the confidence and expertise to act effectively and efficiently in a time of crisis. As mentioned the UCO Survival Stormproof kit includes several essential items. 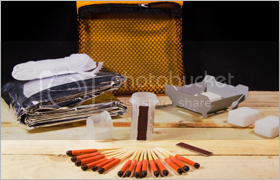 The matches come in a compact, waterproof case and will stay lit for up to 12 seconds and will not be put out by wind or rain. They will even relight if they are submerged in water, so these matches will help you build a fire in any condition. The emergency stove folds flat for storage and easily expands when you need to use it. The fuel tablets it comes with will burn for 12 minutes, enough time for you to boil water for sanitation and again, help keep you warm when you need it. The compact tent reflects and retains 90% of body heat and fits two adults. A tent like this could be essential when the temperatures drop quickly out in the wilderness or when there is a power loss. It’s lightweight and packs down to fit in any emergency pack. Head over to their website to check it out this lightweight survival kit now.